I had a slightly better night on the Friday night in the hospital and actually had to be woken up on the Saturday morning to have my blood pressure etc taken. I had breakfast and a shower and packed up to go home. The discharge time was at 10am and my husband and son were coming to pick me up. I asked them to get some chocolates and card and before we left I distributed these to the nurses, catering and the folks in the recovery room (to say sorry for talking rubbish). We hopped into a black cab and within 10 mins I was home. I got home, unpacked my hospital bag and I think I may have put the laundry on. I pottered around just tidying the flat up a bit, feeling slightly dopey but in no pain at all. Ireland was playing France in 6 Nations Rugby so I got comfy on the sofa – bliss. I may have made a tactical mistake taking a Tramadol just before the game – at one point my husband nudged at me; I had been staring at the wall for the past 5 minutes. I don’t remember much about the match to be honest. As luck would have it, on Sunday night my son came down with a high fever and ended up camping in our bed for a few nights. My poor husband was trying to juggle work while looking after the two of us. I was slightly nervous about little elbows and jumpy feet kicking at my stomach but “luckily” he was well out of it. The Tramadol gives you very weird dreams and messes with your sleep patterns so my nights weren’t really that great anyway. Which is ironic as the reason I was taking it was to be able to sleep as it initially knocks you out but then you do wake up a few hours later having hunted dragons in the Bulgarian sewage system or some such nonsense. On Monday, 4 days after the operation, my boss was in the London office so I left my husband playing nursemaid to the little one and hopped onto the bus to go to work. The underground would have been too much for me as people are very aggressive (well, maybe it’s just me) during the morning commute but on the bus I could get a seat the whole way. I felt ok but by 2pm I was getting knackered so returned home and went straight to bed. All in all the recovery during the week after the operation has been fast. I took it very easy and spent most of it in bed, mainly as I am so lazy, but did all the laundry and helped my husband with the kids. 8 days after the operation I went for a walk and ended up doing a 10km route. It felt good so why the hell not! (Though the next day my groin was killing me, not sure what the connection is) I was off the pain medication (even ibuprofen) completely by 5 days after the operation – I don’t think I really needed to be on it even that long to be honest. There has been some bloating and it seems to get worse if I move around. Today I am 11 days after the operation (and I am back at work) and the only reminder to me really are the 4 plasters on my stomach. I call the holes my ports and there is some discomfort from them, especially on the right side, but nothing major. I am seeing the surgeon this Thursday (I assume he will remove the stitches), at 2 weeks after the operation and I will be begging him to give me the go-ahead for gentle jogging. I will have to ask him about the hormone levels. As my ovaries were left behind, things should be ok but I know that it might take a while for the levels to get back to normal. I have been having hot flushes and waking up at night feeling very very hot but I am expecting this to pass. I know I am lucky – I have two children and the decision to have this operation was as much mine as it was the doctor’s. I haven’t felt upset or down except for when I stopped taking the pain meds; I even get a downer after a big night boozing so this was expected. I feel good and I am happy I did this, I can now focus on getting on with things. 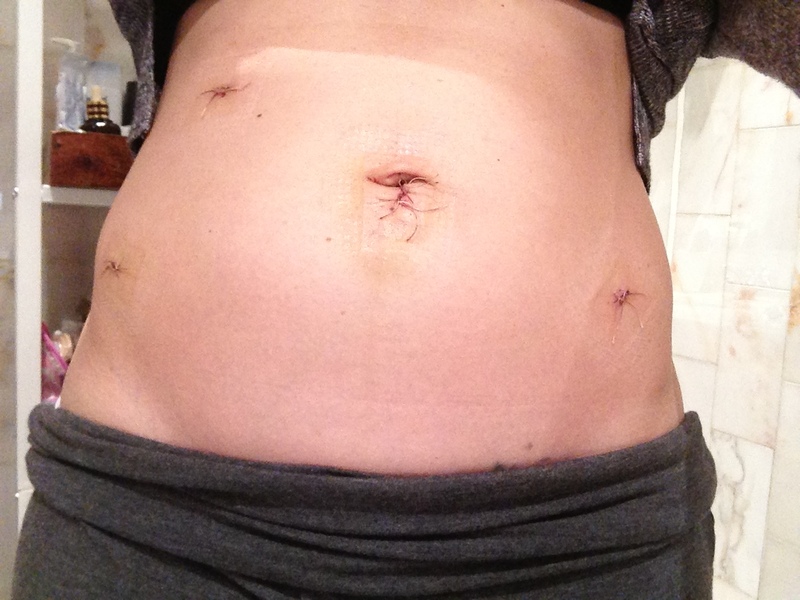 I think from now on this blog will focus less on the hysterectomy as I feel it is now in the past – done and dusted. My next goal is to be allowed to start running again and I will then slowly start building up to a marathon distance. I have no timeframe in mind, all I know is that I want to be able to do it. Just can’t wait to get out there again! I am trying to think if there was anything else but this is all I can think of. None of the above has been limiting, except for maybe the tiredness. I had a night without them!! Woohoo!! The only thing waking me up last night were the bloody birds outside. This is good! I have never heard of dong quai but have been meaning to get my paws on black cohosh. I started taking Agnus Castus when I went off the pill and am still on it. I love that all these natural things are so potent but I sometimes wonder if I know what I am doing, taking so many supplements. What do you think causes the groin pain? I felt so bloody stiff the next few days. and lord knows i have a treasure chest of natural supplements. g just laughs at my supply. i’m like a doomsday prepper with vitamins and stuff. if the world ends, and someone needs a vitamin d tab…. i will have you covered. that or an omega 3-6-9 gel. or some black cohosh. or something equally natural and in a tablet form. Glad to read everything is coming along nicely…. 5 hours! Blimey! I don’t think mine was longer than 1,5hours – minor compared to yours! You are just as crazy/stubborn as me – it does take a lot more than an operation to stop us for longer than necessary. 🙂 No pain, no gain – eh?